Are you currently a year 7 student, or above? Would you like to perform in the world’s largest youth music festival? Would you like to be part of a choir of 450 that sings a piece that has never been sung before? 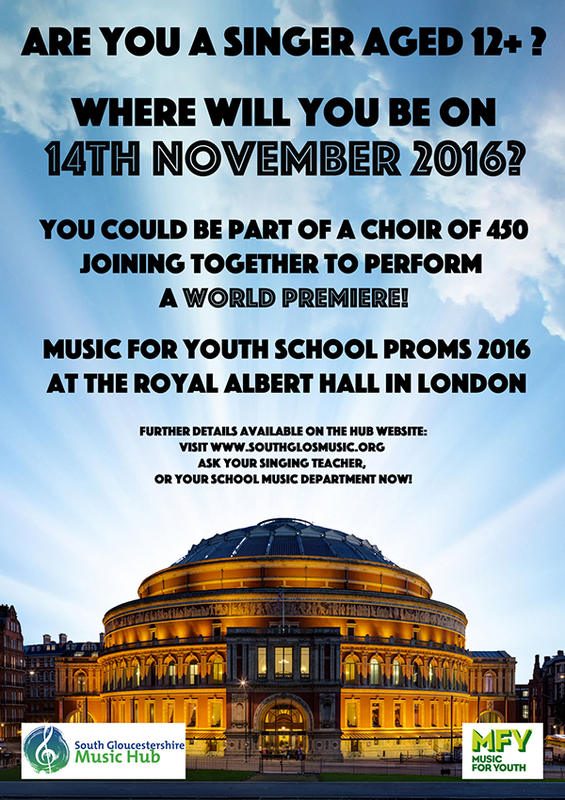 Would you like to sing in the Royal Albert Hall in London? If the answers to these questions is “YES!” then we would like to invite you to be one of 150 South Glos Singers to join with choirs of equal sizes from Gloucestershire and Bath and North East Somerset. You will be performing the world premiere of a new piece with a Shakespearean theme, composed by internationally acclaimed local composer Philip Harper, and you will be accompanied by a wind band of 150 from the three participating local authorities. Be available to travel to and perform in London on Monday 14th November 2016. The chance to be part of something brand new – performing a world premiere! Create a memory that you will remember for the rest of your life. The cost for the entire experience, including music, travel on the day, T-shirt etc is going to be £50. South Gloucestershire Music Hub is covering a great deal of the cost to support the project and your school might also help you with costs. If you are interested please complete the registration sheet (MFY Schools Prom Registration Form) and send it as instructed to the Music Hub by Friday 16th September if you would like to take part.